This may be my favorite bar cookie. I always associate it with fall and winter because the flavor combination of caramel and nuts is lovely together at this cool weather time of year. One of my old neighbors gave me the recipe and we have been baking them ever since. My children love them too. The cookies freeze beautifully if well wrapped. Preheat oven to 350 degrees. Spray or grease 9×13 metal baking pan then line it with parchment paper. Begin by making the crust. In a food processor bowl combine flour, confectioners sugar, salt. Pulse to mix. Add diced butter and pulse until you get a crumbly mixture without large lumps of butter. Pour the crust mixture into the prepared pan and pat the crumbs down firmly to form an even crust all the way to the edges of the pan. Bake crust for 20 minutes rotating the pan half way through baking. The crust should just be beginning to get some color around the edges. While the crust is baking make the caramel pecan topping by combining in a 2-quart saucepan the butter, honey, cream, brown sugar, salt and vanilla. Turn heat to medium low and whisk constantly, until the butter and sugar have melted. Do not boil. Set aside. Remove the pan with with pre-baked crust from the oven. 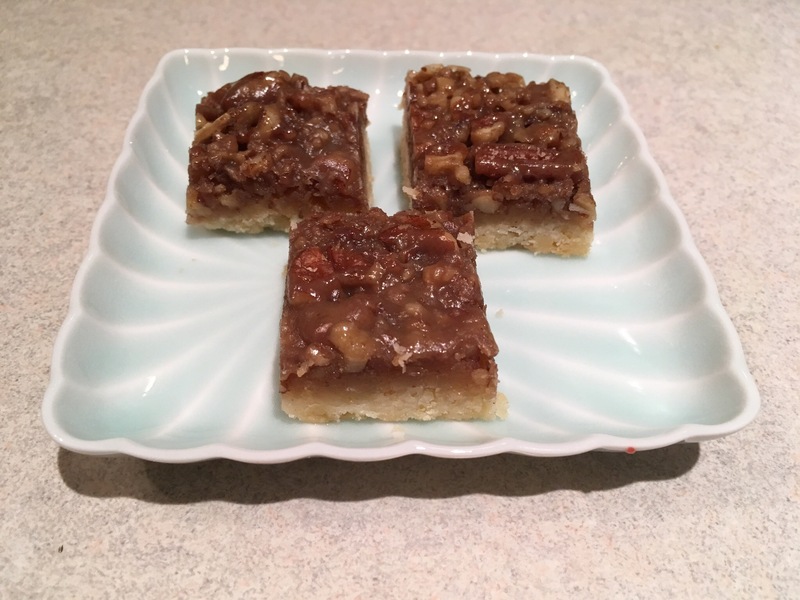 Gently sprinkle the chopped pecans evenly over the crust then carefully pour the caramel over the nuts so that the caramel is evenly distributed over the nuts. Return the pan to the oven and bake 15 more minutes until the caramel is bubbling. Remove from oven and cool on rack. Then cut. Makes 30 squares or 50 bite size pieces. This entry was posted in Christmas, Cookies, Desserts, Thanksgiving. Bookmark the permalink.